Effective newspaper advertising may seem like a very abstract term for a newbie in the newspaper advertising industry. Well, it is very simple, effective newspaper advertising refers to making the advertisement fulfil the goals it was meant to achieve. It should be able to drive the desired audience response and reach out to the relevant target audience. Well, the answer is quite simple and requires you to consider only 5 simple points to remember while engaging in newspaper advertising. Newspaper selection forms the crux of effective newspaper advertising since it is the medium of communication. Based on the coveted results or audience reach, an advertiser needs to choose the preferred newspaper. For example, if the objective of a local garments store is to promote its clothes and offers available, then the best bet would be to go for a newspaper which is locally popular and has a high circulation to ensure higher footfalls to the store. It can either be an English or Hindi daily or a regional language daily, whichever has a readership in the targeted city or locality. A particular Newspaper is distributed across different cities and has special packages associated with multiple locations covered by the concerned daily. Some newspapers even have special district editions such as Eenadu that covers all the districts of the state of Andhra Pradesh and is not limited to only cities. 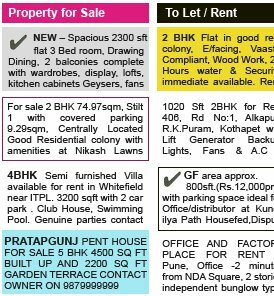 Depending on the reach an advertiser intends to have, the edition (read as location/neighbourhood/city/district/country) of a newspaper should be selected. One more thing must be considered, that in case the exact location is not available for the chosen newspaper, then an advertiser must choose the closest location to the original preferred location. For Instance, if you want to advertise in The Hindu and the preferred location is Pondicherry which is unavailable then the closest edition which can be chosen is Chennai which will reach out to the readers in Puducherry as well. Supplements are specific to categories such as Business, Entertainment and Lifestyle, Recruitment, Property and even Public Notices and Tenders. Selecting the right supplement or pullout published under a preferred newspaper is essential to reach out to the appropriate target audience. 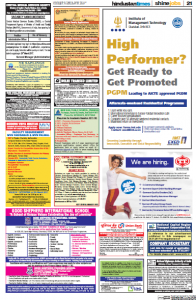 If an advertiser wants to book a Display Education advertisement in a supplement of Times of India, there is no point in releasing it in Times Property. It will be most relevant only when it is published in Education Times, which is the specific education pullout of Times of India. Newspaper Supplements have a specific day when they are published along with the main newspaper. Getting an ad released on a specific day ensures higher responses from relevant audiences. The purpose of the advertisement is instantaneously affected by advertising on focus days. Even if the ad is not published in the specific supplement, but is released in the main newspaper, the response rate for that ad versus the one published on a different day will be much higher. This is simply because audiences keep an eye out for the category specific supplements on their focus day to access them, should the need arise. An advertisement is communiqué which demands the need for content which communicates the intended message to the audience. This creates the need to provide relevant contact information that includes all the communications modes like phone/SMS, email, website and the local address. Providing contact information helps imbibe the faith of the audience as well as creates a sort of assurance in the consumer that the advertiser is available for direct communication. Also providing different mediums for communication will ensure that anyone from anywhere can contact the advertiser. By now I am sure you have comprehended and gained enough knowledge about the field of newspaper advertising and its effects in India and the Indian audiences. So pull up your socks and get ready to help advertisers gain the attention they have been looking for. Newspaper advertising, if limited to classified ads, is the easiest way to reach out to people, especially in case of personal requirements or small scale promotions. 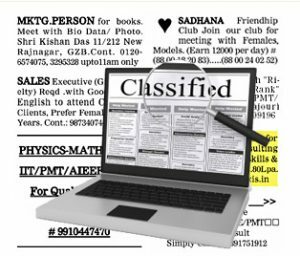 Taking risks or making small mistakes in classified advertisements may not be a big issue due to its low cost. But when it comes to something as grand and expensive as newspaper display advertisement then, advertisers need to become meticulous about everything associated with the advertisement. Advertisers are aware of the fact that a lot of hard work goes into newspaper advertising, in terms of money, time, effort, market research and creativity. Hence, it is necessary to be very careful with it and avoid making mistakes which either leads to spoiling the reputation of the advertisers or dumps the efforts made in waste if desired responses are not received. While getting your newspaper advertisement released ensure relevant responses from the concerned target audiences, by avoiding 10 crucial mistakes made by many. Although a winning newspaper advertisement may not be subject to avoiding these mistakes but they should be avoided by every ad. Ensuring that these mistakes do not harm the potential of the advertisement is the main objective of encompassing and informing advertisers about them. Let’s find out these mistakes along with possible solutions for the same. While advertising it is really essential to realise that an advertisement is also the form of communication with the masses and communication should be comprehensive. The simpler the content of the ad the more comprehensive is the advertisement. A tagline should give out the message but in simple words and not in some flowery terminology, because in advertising using uncomplicated terms, is extremely crucial. Abstract taglines are often baffling for the readers. It barely delivers the message and actually leaves the audience wondering as to what is the purpose of the advertisement. For instance, if you intend to advertise your jewellery retail chain, then you must mention jewellery in the tagline or the type of Jewellery you are promoting, like “The Best Kundan Jewellery at a store near you!” This statement conveys the message as well as talks about the product that is promoted. The key strategy of an advertisement is to deliver a message, be it for sales, branding or an announcement. 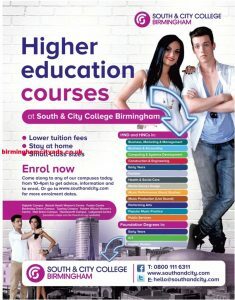 The primary necessity of an advertisement is to be crisp and concise because it is an advertisement and not an essay. Copy or Content is always an essential ingredient of an ad, but using it judiciously and effectively is what makes an advertisement stand out among the rest. So keeping the words or message concise in an advertisement ensures a much more elegant and crisp way of delivering it to the target audience. It takes the time to gain the trust of any buyer irrespective of the medium of advertising. It also takes the time to establish the name of a brand and create a substantial recognition for it. Also, if a festive offer is running for a certain period of time, then announcing the event just once may not be enough since readers may tend to forget about it. Therefore, just one advertisement is never enough for either branding purposes or for increasing sales. Multiple ad insertions mean that the chances of the ad getting noticed are increased by many folds alongside increasing the number of repeated eyeballs it receives. Many advertisers often get discouraged by a single trial advertisement and end up concluding that newspaper advertising is not effective. The same advertisement if released several times may not get the responses it is expected to. Versatility is always welcome for the ordinary readers and audiences. So newspaper ad trials should not be limited to just one ad but released with a few changes every time it is published. Changes, such as using a different image or a more direct tagline, crisper content or even a different background colour may make it more relevant or attractive to the audience. This is the basic requirement for an audience to be able to contact an advertiser. An address alongside a contact number and an email or a website, if available provided in the advert can prove to be highly beneficial to the advertiser. In fact, it is best to provide all these details as the audience can have at least one mode of contact in the absence of others. For instance, a person without internet access should be able to contact the advertiser through phone, while an interested buyer without a phone can directly visit the store for purchase. While promoting a product or a sales event or offering festive discounts, it is essential to advertise at the right time. Timing is extremely crucial for advertisements even for making announcements and brand awareness adverts. There is no point in reminding the audience of the brand twice within a week, neither is there a point in promoting the Sale period after it is over or making an announcement which has crossed its deadline or too close to it. An illustration explaining the situation can be garnered through a series of adverts by Shopper’s Stop that needs to promote their Diwali offers which extend over week overlapping the festival. In this case, there is no point advertising after Diwali is over unless it is extending even after the festival, rather the event promotion should begin from the day it begins and continues until the day it ends. Avoiding these mistakes may not make a display ad full-proof or a huge hit, but it will surely get it noticed and make it stand out among the rest of the advertisement that we see every day in a newspaper. So keep these mistakes in mind, to avoid making them, not implementing them! Retail Advertising is one of the most interesting forms of advertisements that we see in our day-to-day lives. It involves several elements which are all equally essential and cannot be taken for granted. Retail advertisements may not be a very regular thing for newspaper publications but surely they are a huge source of revenue. Since when they choose to advertise, they do so in bundles within a stipulated period of time. 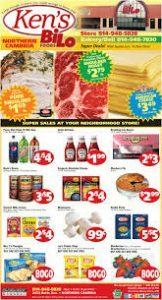 Retail newspaper ads in the display format are published mainly for one specific objective-Driving sales and Store Footfalls. This is the reason behind retail adverts to get their ads released when there are special offers, discounts or festive overtures, going on in the store. Retailers usually prefer to advertise throughout the stipulated date range of the proposed event or Sale/Festive Seasons. The purpose of almost all retail adverts is to increase the sales of their merchandise and branding is not really their top priority. Therefore, to comprehend what are the essential elements for retail advertising, we need to delve a little deeper into the world of retail advertising. The important elements of a retail advertisement are described below in the order of their significance in an advertisement. To drive sales and ensure the higher number of footfalls, it is important to comprehensively deliver or convey the call-to-action. The customer or potential must be aware of his/her course of action after reviewing the advertisement. The call-to-action is a part of the copy that is developed for the advertisement. It can also be a directly conveyed through a simple yet effective tagline, for example, if you want the buyer to visit your garments store before the 25th of December, then you may straight away use the tagline “Visit us before Christmas ends for Best Discounts”. This kind of a tagline not only conveys the duration of the offer period but also directs the reader or potential buyer to the intended action, ensuring more relevant responses for your advertisement. 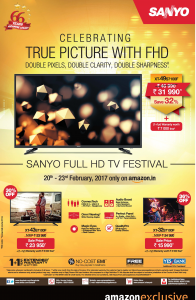 The visual effect of a display advertisement in a newspaper is quite significant in the case of retail advertisements. The ad image should include one or more merchandises that are being promoted by that specific retail store which may range from garments to jewellery to commercial bazaars. This actually lures the buyer to engage in reviewing the advertisement and responding to it as desired by the advertiser. The logo of a retail brand is also quite crucial at the time of advertising to push up the store sales during a specific season. Buyers should be able to associate the logo with the concerned retail brand name to imbibe faith and remind the buyer about the advertisement and the event alongside the brand itself. This calls for developing an unforgettable logo that is imprinted in the mind of the buyer or anyone who comes in contact with the advertisement published in a newspaper of your choice. Taking the help of an expert is recommended for logo designing as it may not be as easy as it sounds. The colour combination, the relevance of the logo with the brand, the font used and every minute detail is really important for the image of the brand. Before engaging in a retail advertising venture, an advertiser must ensure that all the above elements are skilfully implemented in the ad, because, after all, everyone is advertising to compete. 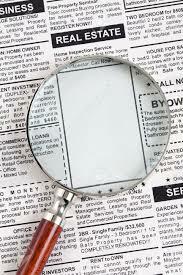 Appointment advertisements, more commonly referred to as display recruitment adverts are very frequently published in newspapers. 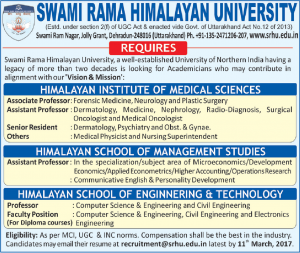 India is a country of opportunities and people take their education and careers very seriously. Recruitment agencies and companies with vacancies are pretty much aware of the fact that every educated individual is on the prowl for better and bigger opportunities. To fulfil this desire for acting upon better career breaks, recruiters advertise through the most commonly used medium of mass communication-Newspapers. Display recruitment advertisements are so common in newspapers that often they have to be rescheduled by the publications for a later release date. This also bears testimony to the fact that the competition and the need to be prominently seen is higher than other category advertisements. Therefore following certain simple steps and taking the help of a few basic tips can ensure higher visibility for recruitment advertisements in newspapers. Recruitment or Appointment advertisements serve only one purpose-Hiring Relevant Candidates! Let’s find out about the elements that are essential in an ad that intends to hire skilled people. In the case of recruitment display ads, the need to be creative with words is of minimum significance. Here providing the correct information about the hiring organisation or consultancy and providing the correct and complete Job description is much more essential. Therefore while creating your ad, consider the formulation of an accurate and brief Job description to help the applicant comprehend the requirement for the position open and tally them with his/her skill-set and academic background. Appropriate contact details including address, location, contact number, email and website (if any) must be provided in the ad along with the call-to-action. For Instance, it must be made clear in the advert that whether the applicant needs to directly Walk-in for the interview, apply online, email the resume or simply give a call to the concerned Human Resources department to schedule an interview. The logo of an organisation helps the audiences become aware of the brand name as well as helps in brand recognition. The logo of an organisation with the need for hiring talented candidates is of primary significance it represents the symbol of recognition for the recruiting company. It is the main component of a company’s brand identity and is the most frequently visible mark of the organisation. A logo represents a company in the absence of any other form of visual or direct representation. In any display advertisement meant for recruitment, placing the company in the right place for maximum visibility after it is designed in a simple yet effective manner by experts. As an advertiser, you need to ensure that while hiring candidates too, you are ensuring brand recognition in a way, in turn serving a dual purpose, therefore, a logo is of utmost significance in the case of appointment advertisements in newspapers. Images in recruitment advertisements are used mainly to attract the attention of the reader or the target audience. So it is essential to use an image that highlights either the field of work for which there is the vacancy or highlight the achievements of the company in order to pursue the applicant to hope for a better future and careers by associating with it. So ensure that these elements are included in your Appointment advert and you are ready to get the r applicant responses you are looking for. Property advertisers are of 2 types-Individual Proprietors and Real Estate Builders or Developers. Each of these property advertisers has a need that is different from the other, in terms of advertising and it is necessary to address those requirements through newspaper advertising. For individual property owners, the deal is quite simple. They need to book classified advertisements with a few enhancements to make their ad noticeable and place under the correct sub-category, such as to-rent, for sale, accommodation available, accommodation wanted etc. in order to reach out to the relevant audience. They also need to provide proper contact details to ensure that the interested parties are able to directly contact them and that’s it. In the case of Display Property advertisements, a lot of things need to be kept into consideration so as to make the advertisement effective and noticeable as well as convincing. Therefore some elements are necessarily instilled in a display property advertisement which helps direct the ad to its intended audience. Let’s evaluate the elements that should be kept into consideration while publishing a Property advertisement on a large scale in the display section. In the case of display property ads, promoting the real estate project and getting more and more buyers is the main concern, which leads to only one objective-Driving Sales. In very few cases, Branding is the objective of property advertising, since every real estate project has a new name and cannot be considered a specific brand. Therefore, ensuring that the advertisement is in tune with the concerned marketing objective is the prime step of a successful Display property advertising. The content of a display property advertisement needs to be very specific and crisp. The ad needs to have the contact details of the advertiser and of course, the call-to-action which usually invites the readers or potential buyers to book apartments, flats, bungalows or commercial spaces, whatever be the type of property that is developed. The property booking period also needs to be specified quite precisely, which leads to reaching the goal to acquire buyers within a deadline. The images are an important part of a display property ad, as it is the image that attracts the reader to the advertisement. It should highlight the attractions and speciality involved with the property to encourage the buyer to separate it from other options. It can be a collage highlighting the best features of an apartment/bungalow/commercial space, or it can be the top-level view of the entire property showcasing everything within the building or area. Other secondary elements include the use of a logo, but this is relevant only when a developer has handled many projects and also intends to get involved in branding its real estate development firm. Choosing the newspaper is not a humongous task in case of Real estate advertising since it is mainly limited to a specific region and its surrounding areas. Even if there are buyers from other areas, they would have to view the property in person and for that, they need to be in or around the concerned region. Hence, it is always wise to advertise in a popular, well-circulated and well-read newspaper of the region, which can either be published in regional language or in English or Hindi. 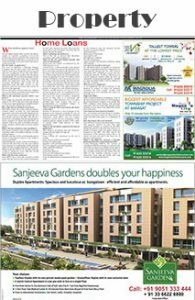 Now be prepared to soar heights with your skyscrapers and win hearts with lavish Bungalows with Newspaper Property advertising.